I have to admit that even I sometimes get caught up in the idea that perhaps maybe, just maybe, the pot and the kettle may one day realize that they are the same. That despite the functions of the two appliances, they both share the same hue. Then again I wake up and remember that this is America. 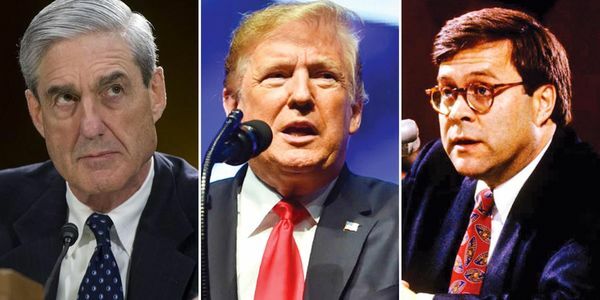 This past weekend Robert Mueller’s complete probe into Russia’s possible interference in the 2016 election was handed over to the Department of Justice and Attorney General William Barr. Yet instead of releasing the findings to the public, especially after the public had to endure endure almost two years of constant news coverage and speculation of foreign influence on the supposed “democratic” election practices held dear to the country (not to mention putting up with the head of the current presidential administration shenanigans), all that was released to congress and the public was a four page summary. Wow! This verb expresses both my astonishment at the decisions of the powers that be to release the findings of the probe to the public as if we are calves suckling from its mother’s teats; as well as to impress upon those powers the fact that as the public we can decipher the difference between water and urine. Weather flash, where I am standing, there is not a cloud in the sky. While I can perhaps go and on concerning this skullduggery of the elitists; it is my issues with what perhaps (by perhaps I mean I am almost certain) was found in the in the probe and not what was being investigated. As an educator of the public school system, I grade essays upon essays on a yearly basis. Throughout my career, I must have read over 10,000 essays. The process can be tedious and exhausting; however the content from the essays can range from a myriad of adjectives (I’m a high school teacher). Needless to say, these adjectives can make the grading a task in itself. So, as a rule of thumb, I often will alert my students to what I will be focusing on in regards to grading (yes, I do give a rubric); let’s call this a verbal rubric. Stay with me guys, I am getting to my point. The purpose of my alert to my students is to increase the students’ chances of mastering those particular areas of focus. However, during my grading if I come across grammatical errors, errors in syntax, or any other types of errors which were not identified as focal points, I will still deduct points from the essay; especially if the concept has been taught. In my ancestors and elders prescribed philosophy, I do this because “they know better.” Now I’m certainly not an investigator, political analyst, or news pundit; but I am convinced that Robert Mueller uncovered discrepancies from here to over “yonder” in his probe. Perhaps enough discrepancies to make the possibilities of a Russian interference in an election look like a jaywalking offense (well unless you live in Florida). Which leads me to a number of questions. I refuse to believe that the outcome of an almost two year investigation from an experienced, Vietnam Veteran, who has been ridiculed and belittled by the very person who is at the center of the probe, did not yield anything but a few subpoenas and petty indictments. As my elders and ancestors like to proclaim, ” I was born at night, but not last night.” In addition, the public deserves to get the information the moment that it became available to DOJ and Attorney General William Barr. And please don’t insult us with the narrative of information overload when the public was just bombarded with a litany of scandals, fear tactics, and government shutdown proceedings that is still wreaking havoc on the country. The public does not ask for much. For the most part, we harvest the fruit for the nation but only get to eat the rind. However, what we do desire is that those who are elected to office do the job which they say they will do. We desire that when corruption is evident that those in these offices be held culpable just at any regular citizen would be. Is this too much to ask? Or perhaps I am asking the wrong questions to the wrong people. Buzzed – This is The Drinking Game That Gets You and Your Friends Buzzed!